The Gateway to Halls Bay South. 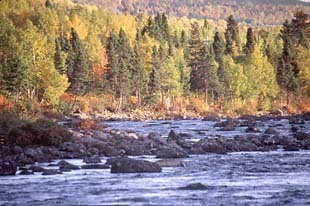 at the mouth of a licensed salmon brook. "The town of South Brook is centrally located within Green Bay. It provides a gateway to the Beothuk Trail, and is only a short run from the area's main commer-cial centre of Springdale. At the same time this Trans Canada Highway community of 878 maintains many of the conveniences of a modern centre." 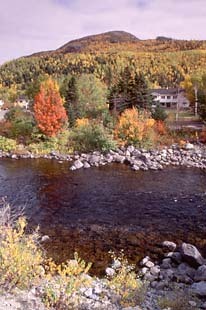 "South Brook gets its name from the brook - actually a river, which leaves South Pond and flows into Hall's Bay at the west end of town. On the east side a large hill dominates the landscape. This 600 ft. incline is known as Rowsell's Hill, and was named after one of the early settlers. In 1784 a merchant by the name of Matthew Ward was running the salmon fishery in the bottom of Hall's Bay, the site of present day South Brook. After only eight years Mr. Ward sold his interest to George Rowsell Sr., a merchant from Fogo Island. Mr. Rowsell and his sons operated the fishery in South Brook for quite a few years. It is not known if this Rowsell family settled here permanently, but in later years we see evidence of George's descendants. The first documented English settlers were Henry and Drucella Rowsell and their children Eunice, Martha, Luke, and George. They are said to have arrived during the late 1800's, and Henry and Drucella's graves can still be seen in the old community cemetery. Also in this burial place is the grave of one John Rowsell who was buried in 1815. The Knights, who followed the Rowsells, built the first sawmill and also a water powered mill. Later Mr. Luke Thomas and Mr. Walter McKay built sawmills. The Rowsells and Knights were joined by members of the Barnes, Burton, Saunders and Prior families, who came and built winter log cabins, called tilts. 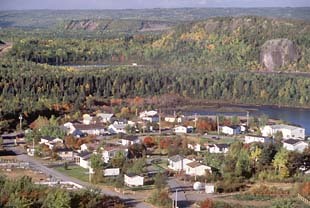 Before the Rowsells and Knights arrived, a band of Micmac Indians from Lake Bras d'Or, Nova Scotia had located in the area. These people lived in their own small village at Wigwam Point - one mile east of South Brook, and at Beachy Cove and Dock Point, both on the Northwest side of the bay. Wigwam Point was first settled in the 1870's by Micmac Chief Levi Joe. 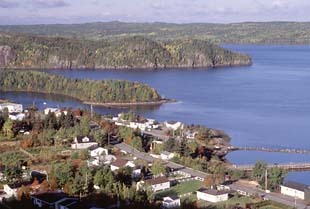 Beachy Cove was settled by the Joe and Bushy families in the early 1880's. In 1921 there were five Micmac families involved in mining and one in lumbering. The local fishermen caught just 50 quintals of cod. The residents had 127 dogs and a horse, and cut 1300 logs. Five furs were sold for $450. A few resident families lived at South Brook in winter and moved to fishing communities in summer. This winter residence continued until 1928 when more people moved in and built permanent homes. According to a local resident, in 1925 there was only one house in South Brook, but many were going up. In 1936 there were nine tilts. Eric Dicks of South Brook says, during the summer of 1936 the flies were so thick that his father, Merrick, had to move the whole family to Springdale. "